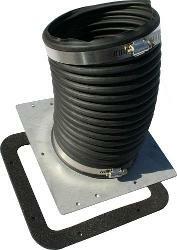 Heater Fresh Air Inlet Boot for Classic Broncos & Ford Trucks. Mounts to inner kick panel on the passenger side and connects to the heater box. This exclusive design provides better airflow by directing the air directly into the heater box without allowing the air to first spread out as it enters the boot. This item is also referred to as a Bellow Seal in some of our publications. Fits 1966 to 1977 Ford Broncos & 1965 to 1966 Ford Trucks. Improved design over factory provides better airflow.